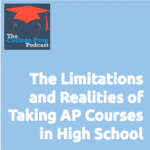 Many AP Coordinators at high schools list all the benefits of taking AP classes, but rarely do they list the drawbacks and limitations. Megan spells out for families a number of reasons why you might not want to take AP classes if your goal is college admissions. Enjoy the episode, and email us at collegepreppodcast [at] gmail [dot] com if you have any comments or questions. This entry was posted in blog, podcast. Bookmark the permalink. © 2019 by The College Prep Podcast	/ Proudly powered by WordPress	/ Theme: thebox by design news.